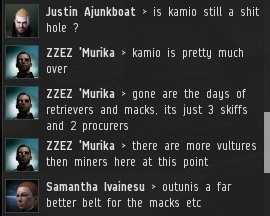 ...The day before we moved back to Caldari highsec. How adorable. 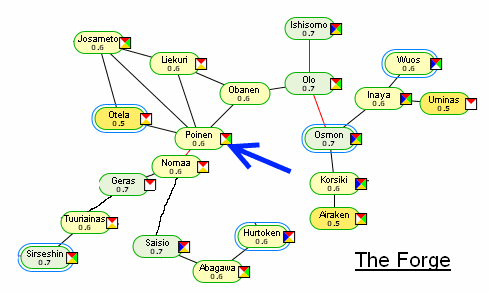 Before long, we were making good progress in Kamio, among other systems within reach of our outposts. But the work of the New Order is never done. You know how it goes. The ice fields and asteroid belts fill up with Code-compliant miners, and the targets run away. Time to make another move! We're plunging deeper into the heart of Caldari highsec. I have selected three systems in the midst of The Forge, from which we can hit the buzzing nests of evildoers. (I had to create two maps because it's awkward to fit them all onto one graphic.) I'd like these systems to be stocked with Catalysts and equipment. 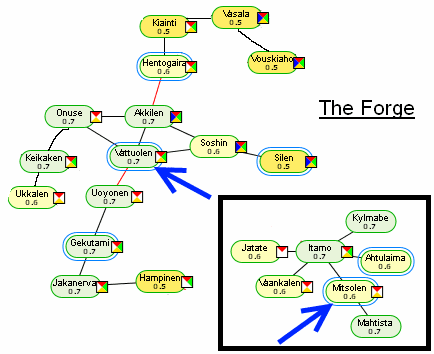 Two of them--Poinen and Mitsolen--are particularly close to Jita. The stations indicated below have insta undock and redock bookmarks distributed via the "corporate bookmark" folder you can see in your People & Places tab if you're in New Order Logistics. It looks like another couple of weeks of interrupted AFK mining for me :). Not that the New Order can do anything about it anyway. 'Spread the love, everyone!' - I love your ineffectiveness New Order. Whoops the should have been UNINTERRUPTED AFK mining. 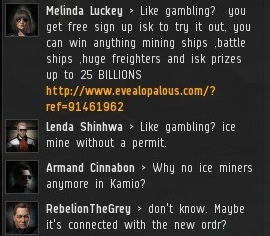 The new order possesses the power to make rebel miners involved in EVE. In your case, it possesses the power to force you to spend hours reading minerbumping threads and making hundreds of comments here. another victory for the new order. Bobbins, how comes you're so persistently interested in the New Order if it's so ineffective? reading minerbumping threads does not cut into afk mining... rather it provides us a rare instance in which we are ACTUALLY TECHNICALLY AT OUR KEYBOARDS. 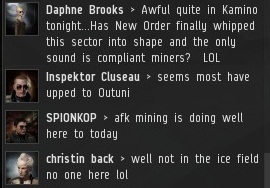 anyways as miners, we lose nothing from tabbed-out forum reading. 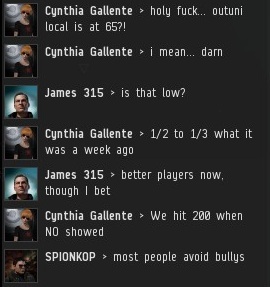 "anyways as miners, we lose nothing from tabbed-out forum reading." Except your ships--except your ships--except your ships; not that there's anything with which you would not more willingly part withal, eh? I'm sure it happens already but it would be awesome if the New Order could hit multiple ice systems in caldari regions in the same day have the ice belts empty of afk miners in caldari space. Then move to gallente or amarr. Someday there will be a new order presence near all high sec systems so those that want to play a single player game can do so by closing the Eve client and load up something else. i'm pretty sure by then there will be a new, better supplied order roaming highsec charging a bil monthly for permits, without blatantly announcing their presence in the region on a publicly viewable blog, while actually keeping track of the permits rather than just relying on the miner's bio. All scouts have access to the spreadsheet of permit holders, anon. Yes, we do know who has paid and who has not. The Bio note is part of the code. oh is that so... pardon my disbelief but i have mined perfectly safely with a fake permit in the presence of numerous new order agents. ofc it might be that they aren't the "scouts" you mention. A fake permit? So you have a "I support James 315" message in your bio and you have no problem with that. That means the only part of the permit you refuse to accept is the 10 million fee. Really? Are you that broke? He's just a typical ice-dependent mining hobo. Addicts lie all the time to support their addiction. We appreciate the support in your bio line, and it is good that you are at least following a small part of the Code, and are properly showing your fear of the New Order. But be aware, that as soon as your deception is uncovered, you will go on the red pen list, and will get continual special attention from us. Do yourself a favor, and send James315 the permit fee that you owe him. You sure are fooling the New Order if this is true. It's not like you are proclaiming to the world that you support them even though, secretly, you don't. But, in the process of not supporting them privately you are publicly supporting them. Personally, I think it's pretty funny that you believe that you are "cheating" the New Order by having a "fake" message of support in your bio. I can assure you that the New Order tracks who has paid. How do I know this? Because I have painstakingly taken considerable amounts of time to set CODE. Alliance standings to well over 600 individual pilots who have submitted the mining indulgence fees, and another 200 or so pilots who have made their way onto the red pen list. \o/ red pen list for me..heartlessly slaughtering useless pods and disposable cats and possibly helping a gank to fail. Something is rotten in the system of Mitsolen. Been watching this mining op go on in bot mode for a week now rofl. Time to wardec them since my awoxery has come to a grinding halt. Big talk from a group who will eventually fall. All you are is bullies nothing more. One day some one will stand up and they will take you down. Mark my words that day is coming fast. Oh man, new tears on an old post.